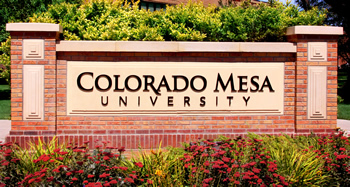 Colorado Mesa University staff members are expressing frustration with the school’s unusual, flat administrative structure, which seems strategically designed to eliminate staff input into school operations, and prevent empowerment of the staff on campus. CMU President Tim Foster over the years has reshaped CMU’s administration to eliminate the normal avenues of communication between staff and administration that most other universities have, employees say. Instead Foster has substituted an odd, flat administrative structure that eliminates staff’s input into school operations and serves as a firewall against opposition to the administration. How Does CMU’s Administrative Structure Differ from that of Other Universities? Normally, publicly-funded universities have deans and provosts, but President Foster has eliminated these positions at CMU. Instead there are only vice presidents who answer directly to President Foster and have little connection to teaching staff. This lack of normal university-style faculty governance, CMU staff members say, leaves no one representing the interests of teaching staff to administration, and no route for staff input into school operations. What are provosts and deans, and why do they matter? A Provost is a university’s chief officer. Provosts are responsible for areas like academic priorities and affairs, faculty appointments and allocation of resources. Deans have authority over the individual academic units of the school, like the social sciences, economics, math or the nursing department. Deans typically report to the provosts, and the provosts in turn report to the school president. In addition to duties like helping students navigate their roads to graduation, deans oversee the staff of their individual departments. The duties of deans and provosts include taking feedback from faculty members and forwarding their views and information about their needs to upper administration. Over time, though, CMU President Foster has eliminated deans and provosts, as though they didn’t matter, replacing them instead with a single Vice President of Academic Affairs. The argument could be made that eliminating deans and provosts saves the school money, but the staff working within this system, and even CMU’s students, say it is costing the school dearly in other ways. Besides leaving teaching staff without faculty governance and representation of their interests, it means CMU assigns zero value to crucial, on-the-ground observations made by staff about the school’s priorities, allocation of school resources and other aspects of CMU’s operation. Without input like this, problems cannot be addressed and the school can’t move forward and improve the way it would under a normal system. All this creates an extraordinarily frustrated and demoralized teaching staff, who must live with obvious problems they see at the school on a day-to-day basis, with little ability to address them. This simplistic organizational chart is the only one posted on CMU’s website. It shows the school has a very flat administrative structure, with no deans or provosts, no teaching staff representation and no oversight of the school’s President. 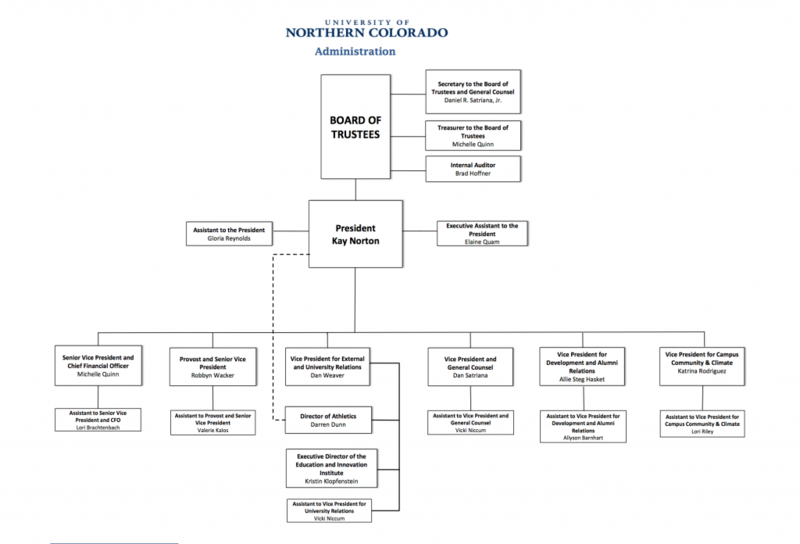 In contrast, the University of Northern Colorado (UNC) posts nine full pages (pdf) of administrative organizational charts on it’s website. They show the detailed structure of UNC’s numerous administrative branches, like the Office of Academic Affairs, Office of Development and Alumni Relations, Finance and Administration, Internal and External Affairs and more. One of nine pages the University of Northern Colorado posts on it website detailing the school’s administrative hierarchy, which includes a provost and six deans. “Event attendance is not the only factor that contributes to a generally spiritless campus. The lack of unification among faculty members also leads to an environment that feels fractured and disjointed. Though professors can be seen in groups of two or three grabbing coffee or lunch, nothing about the campus design or atmosphere encourages socialization between faculty. Thus the opinions of both students and staff are united on this front, and it becomes clear that CMU’s upper management is holding the school back in significant ways. Tim Foster’s restructuring of the staff may have served him well to cement his power at the school and block opposition from staff to what he chooses to do, but it has exacted a severe toll on both students and staff, has brought and continues to bring negative baggage to the school. It may even be contributing to a high level of alcohol use at the school, according to students. Changing the name of North Avenue won’t make this deep systemic problem at CMU at better. It clearly comes from the top. CMU President Tim Foster must recognize that there is a serious chance that the demoralization and lack of personality at CMU has resulted from his restructuring of the administration to cement his own power, and that it has served the school very poorly in the long run. There is a reason that a normal university structure exists: it works for everyone. It gives value to everyone’s input and creates a system that encourages a free exchange of information and opinions about the school and how it it functions. If Foster really cares about CMU’s students and staff and the school’s future, he should consider changing a system that clearly isn’t working for everyone, and in fact has been detrimental to CMU. CMU deserves a chance to become a truly excellent school, not one that students and teachers want to flee after a semester or two. Disclosure: the author is an alumnus of CMU. This blog paints an unnecessarily bleak picture of the state of the Colorado Mesa University campus. I have been teaching at CMU since 2004 and have been a part of the amazing transformation that the campus has gone through. I am currently an Associate Professor of Art. I am also the President of the Faculty Senate (a one year term) and I would like to offer a counter viewpoint. For those outside academia, the Faculty Senate works collaboratively with the administration to oversee the ongoing development and evolution of the curriculum, to address issues that may effect academics, and to voice faculty concerns. Over the past several years that I have been involved with the Faculty Senate we have made a good deal of progress in the area of shared governance. We have a good working relationship with the office of the President and Vice President and while we don’t get everything we request we have been able to make progress on several key issues that are central to our work as faculty. It is not my sense at all that the faculty are “oppressed” and cowering in our offices. I drop into my colleagues offices or go to lunch with them as often as I can. Just last week the Faculty Senate hosted a “Faculty Thursday at The Point” where dozens of faculty got together to welcome our newly hired faculty members to the CMU family. These “Faculty Thursdays” are monthly events and have been well attended. Change and growth can be hard. Last week I had a wonderful conversation with Ben Linzey, the Student Body President, about the Criterion article. We talked about the challenges of being on a relatively young campus that has few “traditions” that would give it “personality”. We concluded that we are kind of lucky to be in a position to help facilitate the creation of new traditions (both academic and extracurricular) for future students and professors. This task will require collaboration, persistence, patients, creativity, and hard work, but most worthwhile things do. I would like to challenge those faculty members who may feel that they do not have a voice to contact their departments Faculty Senator (or myself) and start a dialogue. I would like to challenge the students to articulate a vision of the campus they want to be a part of creating. I would like to invite members of the community to attend campus events of all kinds. CMU has a lot of talent to share with you. Get involved and help us work to create the change you want to see. It’s hard to know where to begin when it comes to addressing just how misinformed you are, Ms. Landman. As someone who has had the privilege of teaching at CMU, I find your tone, comments and assertions outrageous. To be sure, CMU is growing up and, with growth, comes growing pains. Having worked at three other colleges before coming to CMU, it’s almost laughable to see you suggesting that the University of Northern Colorado is some sort of panacea of all things higher education. To the contrary, the place is barely staying afloat. Is it because of their bloated administration or in spite of it? You be the judge. I’m not entirely sure where and how you conduct your research but, if you picked up the phone, I imagine you might be surprised to learn that CMU does, in fact, have a Provost (Dr. Carol Futhey). You may also be surprised to know that the faculty have a number of ways to not only comment on the happenings at CMU, but to actually influence them. From the faculty representative on the board of trustees to the robust faculty senate, faculty and staff DO have a voice and, with all due respect, the place is doing quite well while other colleges and universities struggle (see: State, Western). Might I suggest focusing your drivel on more important matters like whether or not an elected official ever considers a moment of reflection or — EGADS! — prayer!? Emily, I stand corrected. CMU does have a single provost, but no deans. And I did not write about whether CMU was “struggling” financially. It gets more than enough funds, including millions in Federal Mineral Lease funds and $500,000/year from the City of Grand Junction, all money that many area residents believe would be better spent elsewhere, for example on making Horizon Drive safer or helping fix District 51 schools. The fact remains that many people on CMU’s current faculty note that the structure of the administration is odd compared to other schools, and that there isn’t enough value placed on input from staff. Also, sectarian prayer remains strictly illegal at publicly funded institutions and at public meetings. My alternate name for CMU is “Foster’s Home for Republican Friends. Seems like the faculty and students, as represented by the Criterion, have tried to set the tone for this academic year. Will be interesting to see what happens. Well, let me try to answer both the last posts at the same time. 1, the industrialization of education in Grand Junction started with the idea of a retirement home to benefit voted out GOP public officials. It works like this; the voters reject you and you can go straight to assisted living at the college. The Democrats got what they wanted and the Republicans got what they wanted. Now, how do you suppose that happened. Well here’s a hint. 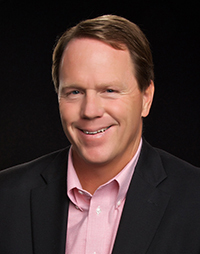 Tim Foster, President of CMU, (former Republican elected official who went to school with and was previously married to Martelle Daniels, former chair of the Mesa County Democrat Party) decided that former Mesa County Commissioner Janet Rowland might need a place to go after she term limited out. Well, you get the picture. Everybody makes out except the actual students who pretty much become useful idiots to the agenda of the week. And guess who pays the bills?? You find a problem in life, you can either paint over the cockroaches or you can search for the way they’re getting in, and put a cork in it. 2. It’s called an opinion, Anne. You get to frame the issue, but not the opinions. As for the argument presented, it fails at face value, because it’s framed around me and mine, not ours. Can you see how I might not have pride of ownership in that? And the way I see it, anybody that doesn’t fully appreciate my home, would probably be happier elsewhere. And I’ll try to be helpful with that. And you still haven’t addressed the three posts I have pending on your site. Perhaps you feel no obligation to address my concerns? And you know what they say; when in Rome…..
Oh my, the little snowflakes are bored. And they’re just not feeling the love and ownership that they might at other colleges and universities. Well, the last time I looked the same roads lead out of Grand Junction that lead them to it. Or optionally, they could join the military. What’s not to like in that democracy. Grow up. That’s why they call it an education, and not a vacation. AP, your comment is a version of the trope “if you don’t like it, leave.” What’s wrong with this trope? First of all, it’s not an argument. It’s a statement designed to shut down a discussion rather than facilitate it. It’s designed to portray the writer as “the other,” someone who doesn’t belong here because they don’t think the same way you do. It fails to facilitate thoughtful conversation. Another problem is it doesn’t even bother to refute the arguments made. It may even be a tacit form of admission, since you don’t respond to the ideas in the article or present any alternatives. So basically, it’s a pretty worthless thing to say. Care to try again? The industrialization of higher education is deplorable and erosive of a progressive democracy. Lack of any incentives for the serfs or professors trickles down to students and culture. No value in science or the arts is represented or promoted in our higher (now lower) institutions. We circle the drain while the rest of the world races ahead.